sepak bola: Manchester United F.C. Manchester United won the league again in the 1999–2000 and 2000–01 seasons. The team finished as runners-up in 2001–02, before regaining the title in 2002–03. They won the 2003–04 FA Cup, beating Millwall 3–0 in the final at the Millennium Stadium in Cardiff. 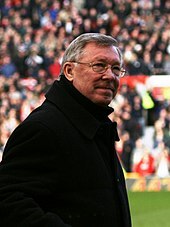 In the 2005–06 season, Manchester United failed to qualify for the knockout phase of the UEFA Champions League for the first time in over a decade, but recovered to secure a second-place league finish and victory over Wigan Athletic in the 2006 Football League Cup Final. The club regained the Premier League in the 2006–07 and 2007–08 seasons, and completed the European double by beating Chelsea 6–5 on penalties in the 2008 UEFA Champions League Final in Moscow's Luzhniki Stadium. Ryan Giggs made a record 759th appearance for the club in this game, overtaking previous record holder Bobby Charlton. In December 2008, the club won the 2008 FIFA Club World Cup and followed this with the 2008–09 Football League Cup, and its third successive Premier League title. That summer, Cristiano Ronaldo was sold to Real Madrid for a world record £80 million. In 2010, Manchester United defeated Aston Villa 2–1 at Wembley to retain the League Cup, its first successful defence of a knockout cup competition.